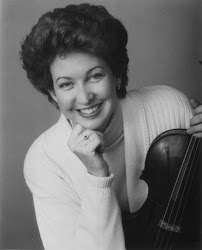 Ellen Rose, a Juilliard School graduate, has served as Principal Viola of the Dallas Symphony since 1980. She has performed with Itzhak Perlman, Pinchas Zukerman and Yo-Yo Ma in chamber music concerts and has appeared as soloist and chamber musician in the U.S., Europe and South America. She served on The Aspen music faculty from 1989-2002 and currently teaches at Southern Methodist University. Rose can be heard on two CDs on the Centaur Records label. Ms. Rose has given master classes at The Juilliard School, Manhattan School of Music, and the Cleveland Institute of Music. She has been a performer and guest speaker at the International Viola Congress in Sweden and at the U.S. Viola Congress. She has written two books: Extreme Viola (a scale book) and Viola Excerpts Plus and published numerous papers on viola technique. In January, 2010, she presented a world premiere of a viola concerto dedicated to her by composer Margaret Brouwer, commissioned by the Dallas Symphony. In March of 2012, she recorded the concerto with Jaap van Zweden conducting members of the DSO, which is due to be released in the Fall of 2016. In 2010, she returned to Romania to do master classes and chamber music concert. In the summer of 2010, she joined the faculty of the Summer Institute in Hungary. In November, 2012, she did a recital tour of China in Beijing, Shanghai, and Kunming giving master classes at the Beijing Conservatory of Music and the Shanghai Conservatory of Music as well as coaching string ensembles. In July, 2013 she participated in festivals in Romania and Hungary. In December 2014, she and Dr. Kristin Ditlow Yuan, pianist, recorded the recital music performed throughout China, released under the title Providence and available through iTunes and Amazon. As a fund raiser, she has worked with Children's Medical Center of Dallas to raise money for the children's cancer unit and has raised funds for The Nelson Center for abused and abandoned children. Her recital fee in Kunming, China was donated to the Kunming International Academy to buy instruments and create scholarships. She was a volunteer counselor at the Dallas Pregnancy Resource Center. Currently she volunteers at the JFK Learning Center. Ellen Rose retired from the Dallas Symphony Orchestra at the end of the 2016-2017 season after 37 seasons as principal violist. In retirement, she continues to teach at Southern Methodist University and conduct master classes.